The Earth is a great place to visit because it has so many different environments. You can travel to a sunny, breezy beach with lots of sunshine. You could also hike in the mountains to test your strength against the ice and snow. Maybe you would rather try a hot and dry desert? Any of these options and many others are available on just ONE planet! Come visit us to join in the fun! Our Earth has been around for over 4.5 billion years. It is the densest planet in our eight-planet solar system, and we're the biggest terrestrial planet out of the four in our solar system. If you want to find our big blue planet, it's the third planet from the sun. What Does Our Big Blue Planet Look Like? 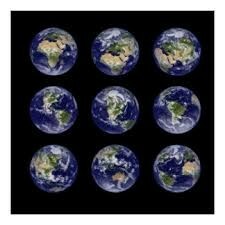 The Earth has an area of 196.9 million square miles. It has one moon that is about a quarter of Earth's size. When you look at the Earth you immediately notice how blue it is. This is because it is 70% water. The 30% of the land is rich with vegetation and other life. The atmosphere is mostly nitrogen, but it is also rich in carbon and oxygen. axis). The Earth's energy comes from The Sun. The Sun generates energy through nuclear fission. Nuclear fission is the energy produced when two nuclear particles collide. The Earth and all other the planets are sphere-shaped because their self-gravity is always pulling in mass equally in all directions. This equal pulling forms a hydrostatic equilibrium. 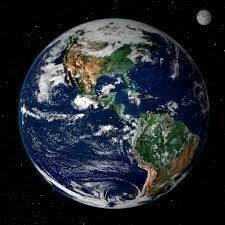 The Earth is bulging around the equator because of The Earth's rotation around an axis. There is too much space between the objects in the universe to measure in miles; instead, that distance is measured in light-years. A light-year is a distance that light can travel in one year. It sounds like it is a measurement of time, but it is actually a measurement of distance. The formation of the solar system was a result of many things, but the most prominent force was probably gravity. Gravity formed The Sun by pulling in materials. The Sun's gravity caused debris, asteroids, and other space rocks/ice to revolve around The Sun. When these space materials crashed into each other, they formed bigger rocks/ice blocks. As these rocks/ice blocks got bigger, they became planets and moons. Earth is a great place to play sports, explore mountains, forests, and grasslands, gather with friends at the beach, and/or study the different forms of life that are supported by The Earth. The Earth has many different climates, so come prepared with clothing for warm, cold, rainy, snowy, humid, dry, etc weather.